Certain varieties of cheese are known for the presence of gas-formed holes called "eyes"
Eyes are the holes present in some cheese varieties caused by the formation of gas due to microbial metabolism. This gas is carbon dioxide (CO2). We’ve discussed this briefly in another post. This post will address Swiss-type and Dutch-type cheeses that contain eyes; namely, Emmentaler and Gouda. Other cheese varieties have holes formed due to microbial action, but are outside the scope of this post. Cheeses like traditional Havarti, Tilsit, and Esrom usually have many tiny gas-formed holes, but we usually don’t call those eyes (probably because they aren’t round). Examples of cheeses with eyes, Swiss (left) and Gouda (right). As a quick aside, I notice many people get confused by the difference between “openness” and eyes. Some cheeses, like Colby, have small jagged openings in their body. These are called mechanical openings and relate to how the curds knit together when the cheese was put into the form and pressed. They aren’t the gas-formed holes we’re discussing here. Colby Jack cheese with mechanical openings, not eyes. As an even quicker aside, this post isn’t covering gas formation caused by spoilage microorganisms like Clostridium tyrobutyricum. Cheesemakers add certain bacteria in order to get eye formation (to be discussed more below). 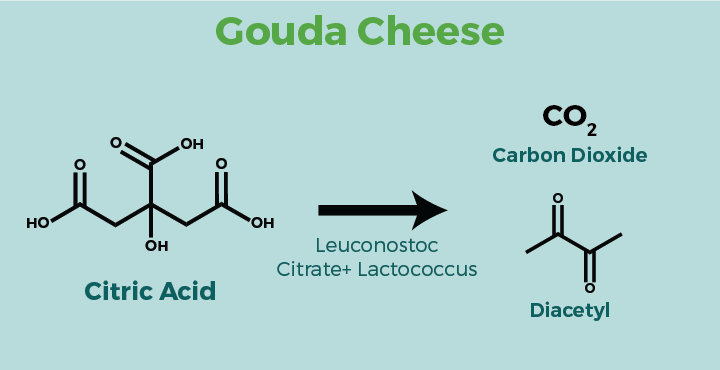 As those bacteria produce gas, the CO2 will accumulate in any air pockets present in the cheese, at loose curd junctions, or other nucleation sites present. With more and more gas, a bubble is formed. Thus we have eyes! Eyes develop at nucleation sites in cheese. In order for eyes to form, the cheese body must be flexible while it is aging. When cheesemakers produce eyed cheeses, they ensure that there will be enough pliability to allow gas bubbles to form nice round eyes. If the cheese body is too hard and brittle, the pressure from the gas will cause splits and cracks to form. Eyes are formed in Swiss cheese due to breakdown of lactic acid by Propionibacterium. Where did the lactic acid come from? From the starter culture of course! Starter cultures metabolize the lactose (milk sugar) into lactic acid, and from there Propionibacterium like Propionibacterium freudenreichii ssp. shermanii metabolize the lactic acid into carbon dioxide (CO2), acetic acid, and propionic acid. The CO2 is what forms the eyes. But the story doesn’t end there. 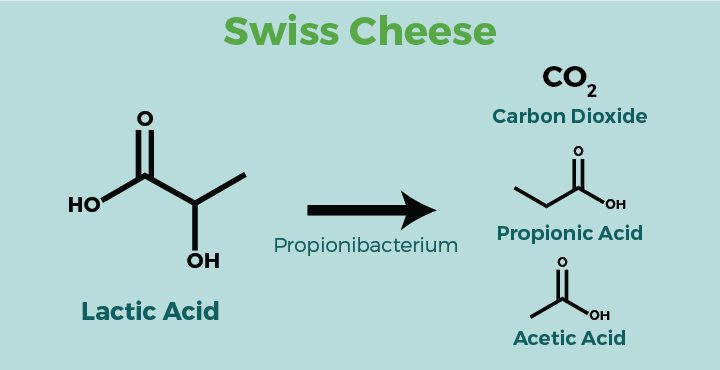 The other products from this reaction also help contribute to overall Swiss cheese flavor. Eyes in Gouda cheese are due to the breakdown of citric acid. Where did the citric acid come from? It’s naturally present in milk in small amounts. Bacterium like certain Leuconostoc species or certain Lactococcus species. Examples include: Leuconostoc mesenteroides and Lactococcus lactis ssp. lactis biovar. diacetylactis. These metabolize citric acid into CO2, diacetyl (butter flavor), and other compounds. These also contribute to the characteristic flavor of Gouda-style cheeses. There are only trace amounts of citric acid in milk, so eye development in Gouda is pretty limited. Mostly, you’ll see a few small eyes.